There are certain things we just take for granted. When we get up in the morning, we expect water to come out of the shower when we turn it on. When we get in the car to drive to work, we assume that when we turn the engine will come to life. These things have become so ingrained in our life that we only notice them when they don’t happen. The color of our food is the same. 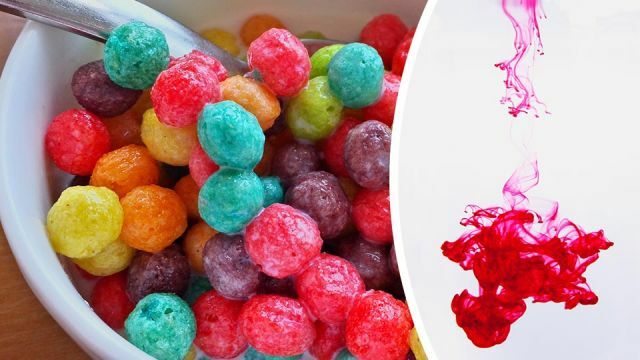 Virtually any processed food you buy, from your favorite soft drink to the cereal you have for breakfast, looks how it is because of food coloring. Generally artificial but sometimes natural, these colors actually shape the way we’ve come to see food — most orange juice gets its bright orange hue from artificial colorings, colas get their dark brown color from, well, brown color additives, and marshmallows (believe it or not) get their white color from blue dye! The fact of the matter is, if food colors weren’t added to the processed or packaged foods you eat, you probably wouldn’t buy them anymore. Those juicy-looking hot dogs would actually be gray without the addition of food colors — delicious! In fact, in the absence of food colors, most of the processed goods you buy would probably be varying shades of brown. And considering processed foods make up an estimated 70 percent of the average American diet, that’s a whole lot of brown. But as snazzy as they look, what’s actually in those food colors? How do they manage to get your orange juice such a vibrant orange color, or your hot dogs red instead of gray? And is there any health concerns you should know about? Artificial food colorings have been linked to a range of health issues. In the U.S., most of our food is colored with artificial coloring. This amounts to approximately 15 million pounds of artificial dyes added to our food every year, a figure that’s far higher here than it is in much of Europe and the rest of the Western world. In the UK, for example, Nutri-Grain strawberry cereal bars are composed of the natural colors beetroot red, annatto and paprika extract. In the U.S., the same bars are made from Red 40, Yellow 6 and Blue 1 — all artificial. In places like the UK and the rest of Europe, high profile manufacturers like Walmart, Kraft and Coca-Cola have responded to consumer complaints about artificial colors by completely removing them from their product lines. Sadly, in the U.S., the FDA continues to allow these synthetic ingredients in the foods we regularly eat. So what are artificial colors made from? Back in the day, most were made from coal tar, a compound that has since been linked irrevocably to various forms of cancer. Today, however, it’s not much better — most synthetic food dyes are now created from petroleum, otherwise known as crude oil. It’s not a great improvement from the coal tar food colorings of yesteryear, and a growing body of evidence has linked artificial colors used in U.S. foods to attention deficit hyperactivity disorder (ADHD), cancer, and metabolic and mitochondrial dysfunction. It’s actually a pretty big deal. A 2013 review of artificial food colors found that “all of the nine currently US-approved dyes raise health concerns of varying degrees.” Those ranged from genotoxic effects, to hypersensitivity reactions, to carcinogenicity. Orange peels? Come on, people! It’s truly a sad day when we think it’s necessary to inject artificial dyes into our fruit to make them look tastier. Cochineal insects are crushed up to make red food dye. 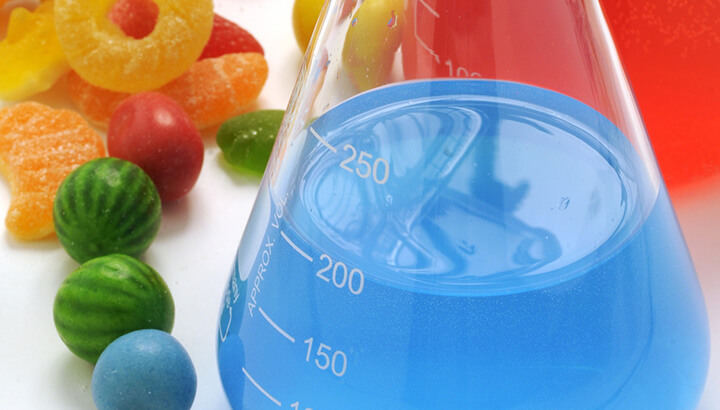 There’s a reason why artificial food colorings are far more prevalent in the food industry than natural colors: cost. Natural food colorings are eight to 20 times more expensive than artificial colorings, making the pro-artificial decision a no-brainer for profit-hungry manufacturers. Carotenoids, as you’re probably aware, are a class of antioxidants that give carrots and other fruits and vegetables their orange pigment. Chlorophyll is a natural compound that gives all plants their green pigment, and today is actually a widely popular health food for liver detoxification along with a range of other health benefits. Anthocyanins are what give grapes and blueberries their deep purple and blue colors. Turmeric, as you know, is a bright yellowy orange. And if you’ve ever got it on your hands, you’ll know that it stains them very easily — the perfect natural dye! However, it gets a bit weirder at this point. Another common natural food coloring, known as carminic acid, is used to dye foods a deep red color. And the source of this color? Bugs! Centuries ago, the Aztecs made a discovery: they found that by crushing up thousands of a type of insect called a cochineal, they could produce a deep red dye for their fabrics and textiles. Upon rediscovering what the Aztecs already knew, modern manufacturers were quick to jump on board and have been coloring your strawberry yogurt and cranberry juice with the stuff ever since. The verdict: stick to natural! If you want to avoid artificial food colors and all the potential health issues they present, your best bet is to stick to natural whole foods — fresh produce, unprocessed meats and organic dairy. But if that’s not always an option, be sure to read the ingredients label on the back; if you see something like Blue No. 1 or Yellow No. 5, put it back and move on! 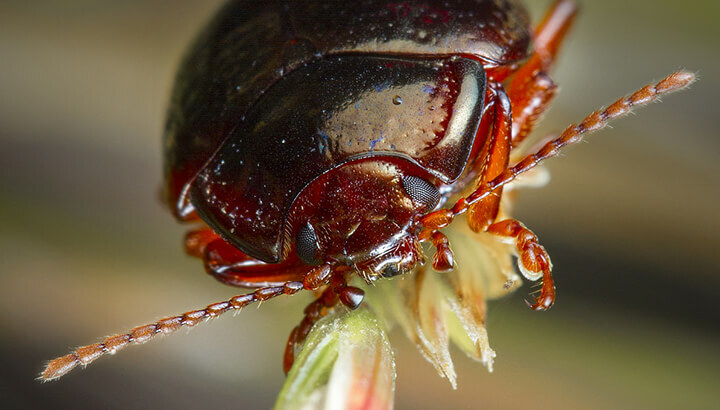 Hey Buddy!, I found this information for you: "Is Your Breakfast Dyed Red From Crushed Bugs? Here’s How To Know". Here is the website link: https://www.thealternativedaily.com/this-is-what-artificial-and-natural-food-colors-contain. Thank you.